Clinton's Portrait Has Hint Of Lewinsky's Blue Dress, Artist Says : The Two-Way Nelson Shanks tells the Philadelphia Daily News a shadow on the left side of the painting represents not only the infamous dress, but also "a shadow on the office he held, or on" President Clinton. 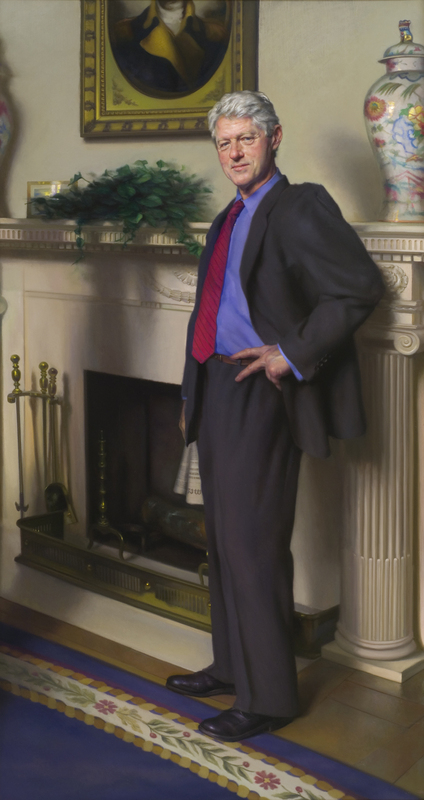 Artist Nelson Shanks' 2005 portrait of former President Clinton, which hangs at the Smithsonian Institution's National Portrait Gallery. Here's a story about that blue dress. No – not that blue dress. Artist Nelson Shanks, who has painted royalty, popes and world leaders, tells the Philadelphia Daily News that his portrait of President Clinton for the National Portrait Gallery has a not-so-obvious reference to the infamous blue dress worn by Monica Lewinsky, the White House intern with whom Clinton had an affair. The portrait, which was unveiled in 2006, is also notable for not depicting Clinton's wedding ring.